This is a short interview that Cindy Funk conducted with me at Vanderbilt University. 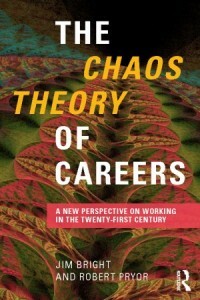 It provides a great introduction to the Chaos Theory of Careers and how it can be used with clients. In the interview I outline the basic ideas behind the Chaos Theory of Careers, emphasising the importance of change, complexity and chance in most people’s lives. It means coaches, counselors, advisors and others need to consider whether we are doing enough to prepare our clients to cope with the continual and unexpected changes that they will experience. I also raise the issue of encouraging clients to look at their life with the aid of multiple narratives or perspectives in order to appreciate the complexity of themselves, rather than trying to rely on overly simplistic ideas about themselves that are likely to have only short-term and limited value. Ideas about complex changing patterns, non linearity or small steps leading to large changes and vice versa are discussed. I also introduce the notion of chance events in careers and explain how these can be leveraged and the link to Happenstance Learning Theory. It raises questions about how well we help our clients with change, what we understand about the nature of change and how we can survive and thrive on change. This entry was posted in Careers Column on October 23, 2012 by Jim B. Bright and Associates provides a range of Career Development Services to Industry and Education, including counselling, coaching, assessment, writing and corporate speaking. They also sell a range of outstanding career development books, card sorts and on-line tests - including the Change Perception Index and Luck Readiness Index. 3-day Career Coaching Counselling and Assessment Course Training Dates for 2018. Book now!